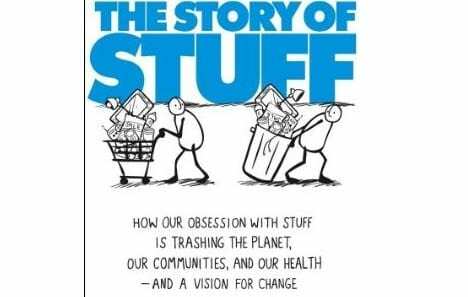 The Story of Stuff: How Our Obsession with Stuff Is Trashing the Planet, Our Communities, and Our Health-and a Vision for Change by Annie Leonard is an in-depth and well-researched book, drawing on her 20 years of experience researching the effects of consumerism and materialism on the global environment. Breaking the life cycle of our stuff into 5 components: extraction, production, distribution, consumption and disposal, she gives you the grim reality of our man-made disaster while balancing it with hope for change with practical solutions. As a history nerd, I appreciated all the historical facts and incidents she mentioned as I had never heard of them, either because they were before my time or weren’t covered in mainstream media. For example, December 3, 1984, the largest chemical disaster to date occurred in Bhopal, India, when poisonous gas methyl isocyanate was released due to improper care; the incident killed 8,000 people. Twenty years since the event, survivors are still suffering birth defects and disease because the company responsible, Dow Chemical, has done nothing to remedy the situation. This underscores why the price we pay at the counter does not fully reflect the true cost of our cheap and disposable gadgets. I loved her emphasis on biomimicry and how that is a more efficient way of solving problems by mimicking nature than our current methods. Allah (Subhanahu Wa Ta’ala) says in the Qur’an. “So blessed is Allah, the best of Creators”. Our solutions to our problems are right in front of us, if we just stop destroying the creation and rather study it as Muslims ought to. After finishing the book I felt drained – not because of the length (307 pages!) or the subject matter, but rather the inconsistency in format kept me on my toes. Overall though I enjoyed the book and it has become a reference book as the research is impressive; for instance ScoreCard where you can find out how polluted your county is as well as who are the top polluters; or phone applications you could use to determine if toxic materials are in your products (which has apparently resulted in many manufacturers removing the toxins). Is it really needed or just a perceived need? There is a reason why fashion changes so quickly, computers and cars look different every year, its rarely because ofbreakthroughs, but rather to enforce a consumer, materialistic society; a society in which people’s life mission becomes to obtain the ‘hottest item’ on the market, to live and work to just hoard more and more. Not only will it save you money and its better for the environment but you will also be aligning yourself with the act of sunnah. As Allah says what means: “But waste not by excess: for Allah does not love the wasters.” (6:141) If you need inspiration there are sites like Instructables where users upload their do-it-yourself projects with instructions, pictures and sometimes even videos. A simple search on Youtube can give you many free demos as well. Check out Freecycle, write an email to your friends and family or post your request on Facebook, Twitter, or any other social media platform instead of always choosing to buy new. This reduces consumerism, garbage piling in our landfills and it builds community as you can exchange items for what is needed. Most of us have things we no longer need and wouldn’t mind passing it on to have an extended life with someone else. If we are not buying toxic and socially harmful products, the manufacturers will insha’Allah quit making them. At the end of the day corporations care about money and their bottom line is profit at whatever expense, so let’s use that to our advantage as more economically friendly products will be making a small difference in the global catastrophe of consumer culture. Enjoy cutting down on all that ‘stuff’ you don’t really need!